I liked these two buildings, the Buckley (left) and the Sheffield (right). They were mirror images over 17th Avenue. I also appreciated the gothic detailing and the classical plantings around these buildings. Crammed on top of Seattle's Capitol Hill is 15th Avenue. 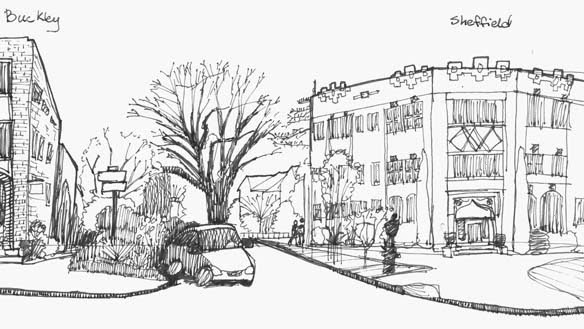 The street runs between hospital mega-structures and craftsman bungalows on its way from Madison Avenue to the University District. I had driven down the street numerous times, but I had never stopped to explore the area. I walked into Victrola Coffee and was assaulted by a wave of noise. I staggered to the bar and ordered an oolong tea. The hostess hastily swiped my card, assumed I wanted my drink to go and hustled me on. Still dazed, I staggered to fetch a lid, looking widely for a place to sit. 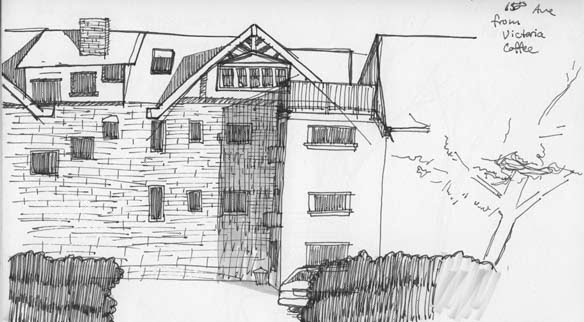 I finally settled on a chair outside where I drew this sketch of The Gables Apartments.